If you come at the Sea Kings, you'd better not miss. Last week we covered the changes Total War Saga: Thrones of Britannia is making to the Total War formula, but how did the systems play out in practice? Here's what happened during our three-hour hands-on with the game. My first act in Total War Saga: Thrones of Britannia is to charge my army at some rebels and get my general killed. It's a blow, because generals are precious heroes that need to be nurtured for a long time to reach their potential. Who will replace this brave (and reckless) leader? It's a fine-looking fellow called Cleircen. Let's have a look at his traits. His loyalty rating is terrible too, even though I've just gifted him the top military position in the Mide faction, an Irish Gaelic Kingdom situated in the middle of Ireland. In Thrones of Britannia you can give people estates to boost their loyalty, or add priests to their retinue to pointedly remind them that betrayal is naughty. However, I don't have any estates, and I have to wait for Cleircen to level up before I can stick a priest on him. Cleircen is good at putting down rebellions though, as cruel mad axemen tend to be. As I order him to smash up the rioters I take stock of my territory and notice that the governor of my provinces, Airemon, is also fiercely disloyal and he already has an estate, the ungrateful so-and-so. I look for depose and assassination options, but they are too expensive for now. I haven't mentioned technology in this account because it just didn't come up during my time with the game. To start unlocking higher-tier units you first need to recruit a set number of the basic troops or buildings. I imagine they are easier to hit once you have learned the requirements, but because I didn't focus in on particular troops or buildings I didn't get going on the research track at all during my few hours with the game. At first glance it seems like a comfortable starting position that should allow me to get rich, build churches, and muster a few armies. Soon I receive a message from my northern neighbours, who want help repelling Ulaid viking raids. I've crushed the rebellion, so why not? Then a few turns later I receive my first dilemma. These yes/no/ignore decisions can put you on the path to uniting your neighbours into a kingdom, which wins you the campaign. My first dilemma lives up to the name. Coastal Conflict invites me to defend the territory of Brega, to my east, from ominous 'Viking Sea Kings'. Or I can seize Brega for myself to create a territory buffer between the eastern coast and my central cities. I decide not to screw Brega, though I have no idea how I'm going to stretch my forces to defend the north and the east against separate Viking bands. I start mustering Axemen, Horse Boys and the Fianna Band. In Thrones of Britannia a recruited unit starts at about quarter strength, so you have to wait a few turns for your army to reach full force. As this is happening, for some reason I still can't fathom. Alfred the Great, comfortable sat in the south of England, declares war on me. What the heck, Alfred. 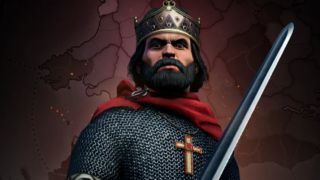 Thrones of Britannia runs on a version of Attila's engine, to ensure stability and compatibility with a wider range of rigs. I only played a few battles, but bar some UI changes this seemed like battles have remained relatively untouched compared to the campaign map, where the team has made big changes to recruitment and technology. Then the Sea Kings come. A couple of large armies trash Brega and march right into my territory. Provinces contain a walled and garrisoned main settlement surrounded by small vulnerable towns where farmers and miners create your wealth. As my army continues to muster the Sea Kings move between these vulnerable satellite settlements and set them on fire. The disloyal Governor Airemon, who ought to be terrified at this stage, promptly levels up. I stick a priest on him. I can't let the Sea Kings continue to run rampant, so I march out of my stronghold to meet them in the field. Their army, the Bringers of Ragnarok, are led by a tough warrior called Bardr. Our forces are evenly matched, according to the game's measurement of our respective forces, but on the field I see that we have different approaches to warfare. I have a balanced army with some ranged troops, spearmen, axemen and cavalry—poorly armoured but at-capacity. The Vikings just have axe dudes. Many, many, axe dudes. The axe men start marching in a big blob towards my army. My serf archers pepper them with fire, but do almost nothing. I notice that their general and his retinue are straggling behind the pack. I flank left with my cavalry and manage to isolate them with a charge. If my spearmen can stick around long enough and I can kill Bardr, perhaps the Bringers of Ragnarok will flee. Unfortunately my spearmen melt away quickly and my cavalry charges fail to kill the enemy general. Instead it is Cleircan, the cruel mad axeman, who falls. The battle is lost. I search my provinces for anyone half-capable of leading a new army and a guy called Ailil is my best bet. As the Sea Kings lay siege to one of my walled settlements, he hastily musters a counter-attacking force in a town to the south west. The new mustering system rewards forward planning, but you can still get an army together in a few turns, and if you desperate enough to throw under-strength units into battle, you can. It is now that I am informed that an assassination plot is forming. As King, I am prepared to admit that I haven't been the best leader, but this is an extreme response, especially so because the plotter is Aedammair, my daughter. A few turns later a pop up message tells me that she's eloping with some bloke called Mathgamain. I passive aggressively select the 'give them my blessing' response. A few turns later Mathgamain raises an army and rebels. What the heck, Mathgamain. I was surprised by how much I enjoyed the political machinations in Thrones of Britannia. It's an aspect of Total War that has always faltered a little for me, but the twists I experienced during just a few hours made my faction feel characterful and interesting. That's offset a little by Alfred's war declaration. Thrones of Britannia's leaders have descriptive traits that give you more of a sense of their intentions than other Total War games, but I still didn't know why Alfred decided to single me out for destruction. My hands-on with the game comes to a close shortly after my daughter and son-in-law's betrayal. Ailil smashes the Sea Kings siege and drives them back, but What The Heck Mathgamain and my daughter are making their own moves on Mide. The Ulaid who declared war on the north ages ago seem to have smashed their way through my allies and are heading straight for me—am I the only one who can put up a fight around here? What's more, I know that somewhere, far to the east, the What The Heck Alfred's forces are surely mustering, looking to deal the final blow to the beleaguered and surely doomed Gaelic Kingdom of Mide.